Fate has it often where those who put themselves in constant danger and face death every day are often spared until some freak accident takes them away from us. 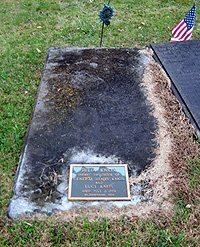 General Henry Knox, one of America’s most noteworthly and often overlooked Revolutionary War General fit that description after serving in some of America’s fiersiest battles, dies from eating a chicken bone. 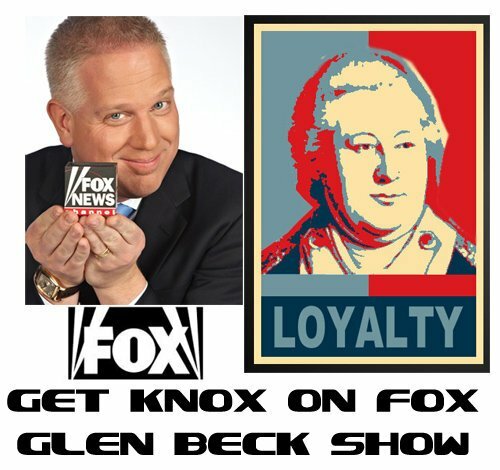 Let’s take a look back at one of the greatest military geniuses of our time, General Henry Knox. 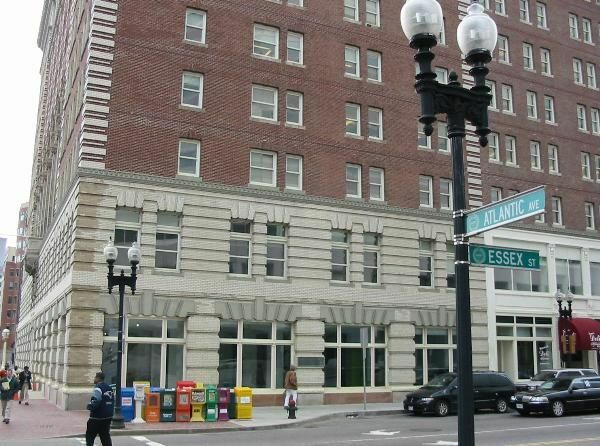 What was once the the birthplace of General Henry Knox, this plaque is at the southwest corner of Atlantic Avenue and Essex Street, across the avenue from South Station in Boston. Henry Knox was born in poverty in Boston to Scot-Irish immigrants William and Mary Campbell Knox on July 25, 1750, the seventh of ten children (only four reached maturity). Father was a ship’s captain and died at the age of fifty. The Gaelic term knox stands for “the hill”. The current site of Henry Knox’s birthplace. Knox home, known as wharf property then Sea Street (later Federal Street), near the foot of Summer Street and opposite the head of Drake’s Wharf near Windmill Point. To create a faster simple read, below is a decade by decade breakdown of the history and accomplishments of Genreal Henry Knox, one of the most forgotten Generals of the American Revolution. There’s also a map we continue to update with historic reference points. 1762 – At the age of 12, after his father’s death, Henry left Boston’s Latin Grammar School to apprentice as a bookbinder at Wharton & Bowes in the Cornhill section of Boston. Knox read and became a self-taught skilled engineer and military tactician. Learned to speak French as well. 1765 – When Henry was 15, the famed Stamp Act took place and colonists were not going to take taxation lightly any more. August 1760 – August 1769 – Sir Francis Bernard was the Governor of Massachusetts (also known as the “Imperial Government”). 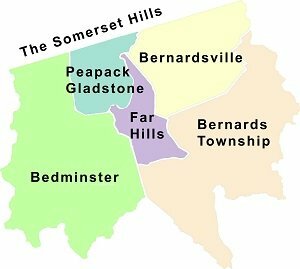 Previously, Bernard was the Governor to the Charter of Bernards Twp, New Jersey back on May 24, 1760. It can be stated that when Boston was getting fed up with British Rule, it was under the rule of Francis Bernard. 1778 – At the age of 18, joined the artillery company known as “The Train” – men from the South End of Boston under the command of Major Adino Paddock (a Tory), a chair maker, where Knox got his first formal artillery training. March 5, 1770 – At 19, while returning from a friends in Charlestown happened upon on King Street (now State Street) in front of the Customs House at the Boston Massacre, where 5 colonists were killed and changed Henry’s life forever. 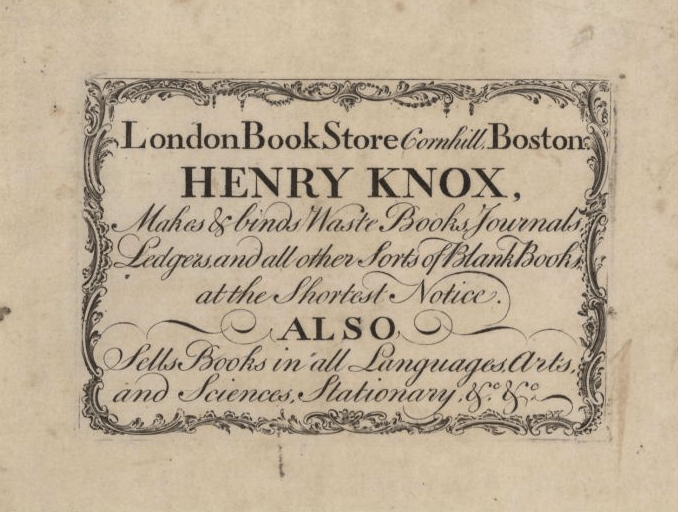 On July 29, 1771, when Henry turned 21, Henry opened his own bookstore called the London Book Store, opposite William’s Court in Cornhill, Boston. In 1772, at 22, Henry formed the Boston Grenadier Corps under Captain Joseph Peirce as second in command (Sons of Liberty). He was put in charge of not all Artillery, but Regiments 1-4, (aka Harrison’s/Virginia (First), Lamb’s New York (Second), Crane’s Massachusetts (Third) and Proctor’s Pennsylvania (Fourth) and Knox’s Corps of Artillery for the Northern Department commanded by Let. Col. Ebenezer Stevens. 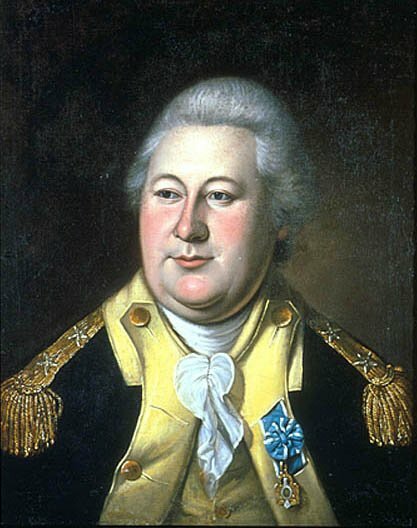 1773 – July 23- while gunning on Noddle Island or Noddle’s Island (named after William Noddle and now what is known as East Boston), Henry Knox lost the third and forth fingers of his left hand when his gun misfired and exploded. He paid 5 guineas to the surgeons to dress his wound for what Henry termed “an unlucky accident”. From then on, on his left hand, he wore his signature black scarf or silk banner which became a trademark look for Knox. 1773, December 16, – Boston Tea Party- 342 crates of tea were dumped off three East India Company cargo ships. 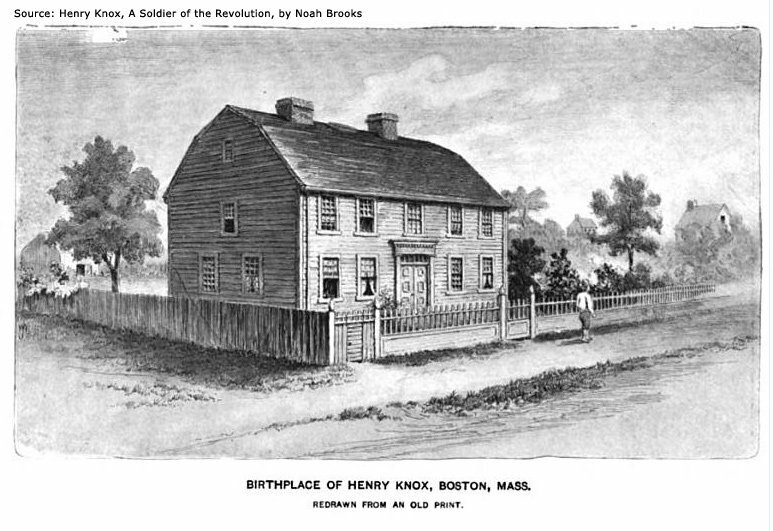 1774, June 16, at the age of 24, Henry married Lucy Flucker (1756–1824), the daughter of Boston Loyalists and Royal Secretary of the Province (Hon. Thomas Flucker,Esq.). The Fluckers were a French Huguenot family who came to American from England. 1775, June – Henry was a volunteer in the patriot army at the Battle of Bunker Hill under General Ward. In 1775, General George Washington inspected a rampart at Roxbury and was impressed with the Henry’s abilities while working under Washington’s first Major Gen. Artemas Ward – Washington appointed Henry to the rank of Colonel in command of the Continental Regiment of Artillery. There was no artillery in Cambridge. His first major task was to go to Ticonderoga to retrieve artillery. At 25, November 17, 1775 – Appointed to rank of Colonel by Washington after delining an offer from the Continental Congress for a rank of Leut. Colonel. December 5, 1775 – January 24, 1776Expedition to transfer according to Knox, 59 cannons (sixty tons – 120,000 lbs) captured by Ethan Allen, and move these British cannons/mortar over 300 miles from Fort Ticonderoga to Boston for the fortification of Dorchester Heights forcing the evacuation of Boston by the British. 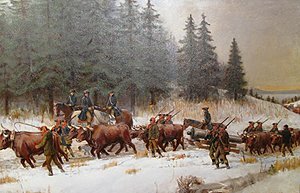 His force brought the cannons by ox-drawn sled south along the west bank of the Hudson River from Fort Ticonderoga to Albany where he crossed the Hudson, continued east through the Berkshires and finally to Boston. There are 56 plaques on the trail from Fort Ticonderoga to Cambridge, Massachusetts denoting the approximately 56 day length of the journey. (almost 5 1/2 miles per day) between December 5, 1775, and January 24, 1776. The Cannon Train was composed of fifty-nine cannon and mortars, 29 from Crown Point and 30 from Fort Ticonderoga. Washington’s army took the Heights of Dorchester, the cannons were placed in a heavily fortified position overlooking Boston from which they threatened the British fleet in the harbor. As a result, the British were forced to withdraw to Halifax on March 17, 1776. Knox took away – 8 brass mortars, 6 iron mortars, 1 howitzer, 13 brass cannon, 30 iron cannon. Directed Washington’s famous Delaware River crossing late Christmas night on December 25, 1776. For the Trenton victory, Knox was promoted to Brigadier General and Chief of Artillery for his leadership accomplishments. Knox was almost displaced of his position as Chief of Artillery by a Frenchman named Ducondray, secured by Silas Deane, the American Minister to France. Ducondray interviewed with Washington and then headed to present his credentials before Congress. Washington wrote Congress on behalf of Knox on May 31, 1777. Unfortunately, in the late summer of 1777, Ducondray was riding a spirited horse in search of Washington in Chester County, Pennsylvania. As he was about to enter a flat bottom boat to cross the Schuylkill River, he lost control of the horse, the horse and rider plunged into the river and Ducondray was drowned. May 27, 1778 – Congress’s “Establishment of the American Army – Each Artillery Regiment to contain 729 officers and men. 1 Col., I lt. Col, 1 Major, 12 Captains, etc. and the entire Brigade of Artillery be 3,000 officers and men of all rank. Each regiment held 12 companies. 1777 – 78 Winter – Valley Forge – Henry Knox creates a Park of Artillery, a separate artillery installation at the Valley Forge Encampment..
At 28, In Pluckemin (Bedminster, New Jersey), in the winter of 1778-1779, Knox formed the Continental Army’s first facility for artillery and officer training in what has been named the Pluckemin Artillery Cantonment or simply the Pluckemin Artillery Park. The Pluckemin artillery training academy has been noted as the precursor to the USMA at West Point, New York, or simply America’s First Military Academy. John Lamb’s 8 artillery companies stayed with Major Gen McDougall in NYC and Poughkeepsie,and Major Gen Putnam at Danbury, CT.
Park of Artillery was notified on Nov. 4, 1778 with orders to commence march towards Middle Brook..
About Nov. 20, 1778 decision was made to locate the “Park of Artillery” at a separate encampment at Pluckemin. Nov 25, 1778 – Knox send his wife Lucy and their daughter Lucy to Pluckemin, with the march to commence at 7 AM the next morning, but they lost one day and got started on the 27th. 22 oxen were used to haul 12 and 24 pound siege guns, the brass howitzers, and the mortars. The 3,4,6 pound field pieces were horse drawn. The estimate is about 525 individuals and 22 forage wagons full of supplies were in transit and a total of 171 horses and 22 oxen were noted on December 13, 1778 at what was named the “Washington Valley Horse Yard”. 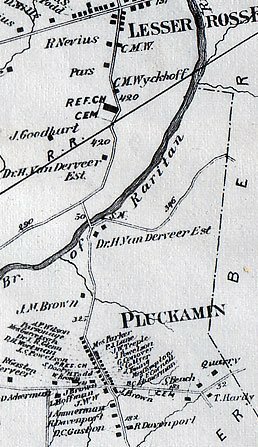 Dec. 7,1778 – left Vealtown at 8AM and marched last 7 miles to Pluckemin, marching thru the village of Pluckemin, crossing the Chambers Brooks and camped in the fields of Colonel William McDonald, lined the pieces up facing the road and then pitched their tents (by Klines/McDonald’s mill)…. Frothingham stored the ammunition in St. Paul’s Lutheran Church, which was abandoned at the time. the spot was chosen since they could see for at least 5 miles around from the ridge and there was a large supply of oak and maple trees. 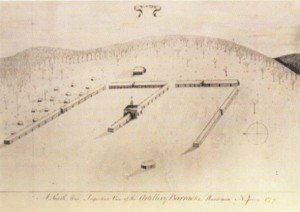 On December 17, 1778 General Washington issued an order that all artillery unites with the Main Army at Middle Brook, NJ to join the Park at Pluckemin, thus doubling the artillery companies at Pluckemin to 22 companies. Sebastian Bauman – December 8, 1778 leaving Morristown with Bauman’s furniture for Mrs. Knox. Sekel mentions that Lucy and Julia were traveling with Lucy? 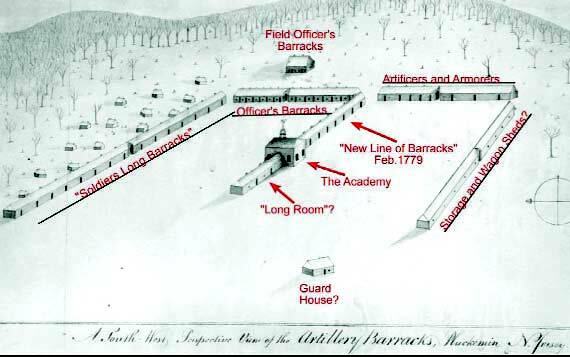 Throughout January 1779 the barracks were constructed. The Academy was the last facility to build – February 1779 – 50 feet by 30 feet, plastered walls with an arched ceiling with a cupola, completed sometime before February 18, 1779. Find the Pennsylvania Packet (document – March 6, 1779 – explains the encampment details. Daily rations were listed as: 21 ounces of beef or 18 ounces of pork, 16 ounces of bread or flour, 1 gill of spirits, soap, and candles. Those who worked on barrack construction got one additional gill of rum per day. The artillerists also received quantities of clams, oysters, and some form of fowl. By January 9th 1779, Knox received word that officers were in the “pernicious practice of gaming, particularly at cards” and that this “most dangerous of vices” be ended as soon as possible. First week of February 1779 on Feb. 6 a dinner dance to celebrate the first anniversary of the Franco American Treaty of Alliance. 177 panes of glass were ordered by Knox for the Academy. Guests began arriving by 4pm on February 18, 1779 – Washington, Nathaniel Greene, Henry Laurens, William Duer,Below the Academy was a Greek Temple containing 13 arches and 100 feet long each holding illuminated paintings of a patriotic scene supported by a “colonnade of the Corinthian order’.. Between February 21 and May 30, 1779 there were only 19 days of rain. On March 7, it snowed 4 inches, and on March 14 it snowed 2 or 3 inches. It snowed on March 17, 19, 24th, and April 17th. It was noted that Lamb’s regiment were particularly lax about their personal hygiene, called a “common disorder”. Washington ordered a signal beacon built “in the rear of Pluckemin” , 16-18 foot square and 20 feet tall with the interior filled with brush. “Lectures every day of the week at the Academy on “mathematics and cc,” were to be given by the “Preceptor” of the Academy “Christopher Colles (1738-1816) born in Ireland, emigrated to America in 1765. From 1775 he was an instructor in the Artillery Department of the Continental Army and taught the principles of projectiles. He died October 4, 1816. October 1781 – Knox at Yorktown. 8 days after Knox opened fire, the British general, Charles Cornwallis, surrendered. October 19, 1781, Knox was advanced to Major-General. At age 31, November 15, 1781 – Knox’s reward was the second star, making him, at 31, the youngest Major General in the army. 1782-1784 : With the fighting over, Knox was put in command of the military reservation at West Point, NY After Washington retired in December 1783, Knox was appointed to replace him as commander in chief until the army was disbanded 6 months later. He oversaw the inclusion of the Springfield Armory as one of two national facilities. May 1783 – at age 33, the Society of the Cincinnati was founded by General Henry Knox and other leading Continental Army officers. George Washington served as the Society’s first president from 1783 to his death in 1799. Henry Knox served as its first secretary. December 4, 1783 – starting at 12 noon, Washington meets his generals and resigns from the Army at Fraunces Tavern in NYC. Co-founder of the U.S. Navy, in 1794 – though the act of 1794 authorizing the construction of 6 frigates was specifically drafted to defeat the small but troublesome Algerian corsairs, Knox oversaw the development of a regular standing American Navy. Knox, in turn, assigned the task of actually designing these first two classes of naval vessels to Joshua Humphreys, a Philadelphia shipwright. http://ww2.mariner.org/usnavy/04/04d.htm – Many historians have labeled these innovative frigates the first “pocket battleships.” This launching was followed on September 7, 1796, by completion of the Constellation, and finally by the Constitution on October 21, 1797. 27 – March 1794 at a cost of $688,888.82. At 44 – with Secretary of the Treasury Alexander Hamilton usurping many of Secretary of War Knox’s powers, Knox resigns in December 1794. 1798 – President John Adams appoints Knox a Major General during a war scare with France. 1802 – President Thomas Jefferson signed legislation establishing the United States Military Academy on March 16, 1802. Jonathan Williams, grandnephew of Benjamin Franklin, becomes the Academy’s first Superintendent. In 1817, Colonel Sylvanus Thayer became the Superintendent and established the curriculum still in use to this day. At 56, on October 22, 1806 Henry went to visit a neighbor and stayed for a chicken meal. He died unexpectedly at 56 years of age after swallowing a chicken bone which punctured his intestine. 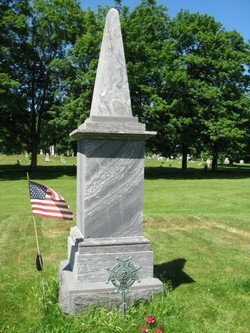 He died of an infection (peritonitis) three days later on October 25, 1806 and was buried in Thomaston, a short distance from his home. Knox at West Point – stayed at John Ellison’s 1754 Georgian-style house in Vails Gate, New York . General Knox was over 6′ boasting a portly 280 – 300 pds at the age of 27. 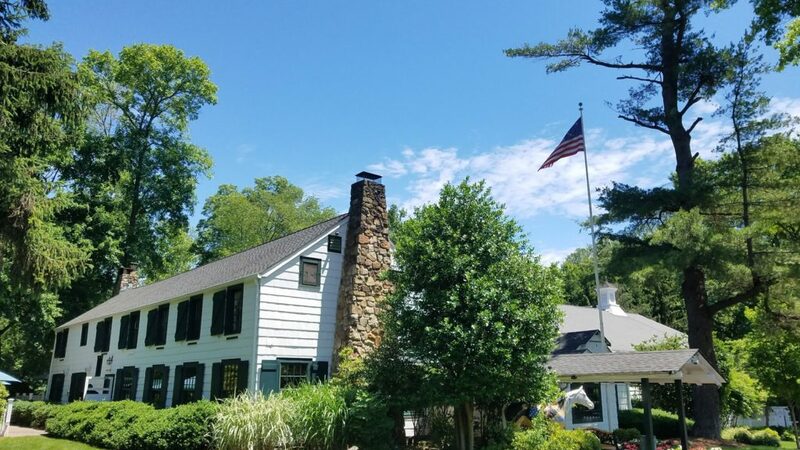 During the war, Lucy camped with her husband’s command at New Haven, Morristown, Valley Forge, and Pluckemin. Ten of their 13 children died before they were grown. Henry Knox’s Montpelier was razed in 1871 to make way for the Brunswick-Rockland railroad line. however, a magnificent replica established in 1929 takes its place. Two separate American forts, Fort Knox (Kentucky), and Fort Knox (Maine) were named after him. Knox Hall  at Fort Sill, Oklahoma, home of the Field Artillery Center and Field Artillery School, is also named after him. Knoxville, Tennessee, is named in his honor. There are counties named for Knox in Illinois, Indiana, Kentucky, Maine, Missouri, Nebraska, Ohio, Tennessee, and Texas. March 16, 1802 – An act of Congress establishes the Army Corps of Engineers. The corps will help shape the nation – The new Congress of the Confederation was reluctant to maintain a large, standing army, and the engineers mustered out after the war ended. After the U.S. Constitution replaced the Articles of Confederation, Congress organized a combined Corps of Artillerists and Engineers in 1794. The current Corps of Engineers traces its history directly back to the second foundation in 1802. Congress also directed on March 16, 1802, that the Army create a new military academy 50 miles up the Hudson from New York City at a location called West Point. One of the Corps’ first jobs, in fact, was to build the U.S. Military Academy. West Point’s first superintendent, Jonathan Williams, became chief engineer of the corps. From its founding until 1866, every superintendent of the academy was an engineer officer. The Pluckemin Artillery Barracks – The drawing was created by Captain John Lillie. Lillie was Captain in November 1778, and was the Continental Army’s Commander of the 12th Company, 3rd Regiment and also aide-de-camp to General Knox. 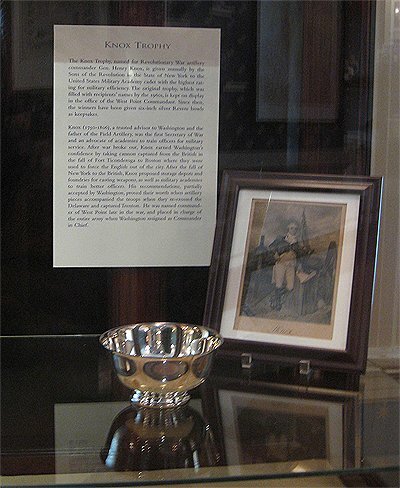 The original drawing is currently on display at the Morristown National Historical Park. General Knox had hired Christopher Calles, a European-trained engineer and scientist. as Conductor of Military Stores. However, Christopher’s main function was to serve as “Preceptor of the Academy,” which all officers up to the rank of Major were to attend military training six days a week. Classes are said to have begun on March 1, 1779 and continued at least into the middle of June 1779. How long the lectures continued after this have not been confirmed. There is evidence that Calles had also hired a number of Assistant Conductors who were in fact young men waiting for their commissions as junior artillery officers to be sent forward for approval to the Board of War. These men went with Calles wherever he moved and presumably received ongoing instructions from him.